Orlando — Business is often regarded as a place of competition not partnership. But Orlando-based Alcorn McBride has forged some close partnerships in the themed entertainment industry, relationships that often have deep roots in personal friendships such as Alcorn McBride’s long association with Birket Engineering in Winter Garden, Florida. Steve Alcorn and Glenn Birket first met when they were Imagineers working at Epcot. When Alcorn left to launch Alcorn McBride and Birket started Birket Engineering they continued their friendship. “Now, 30 years after Steve and Glenn met, the next-generation of leadership at both companies is building on that friendship to their own personal satisfaction and with very successful business results,” says Loren Barrows, Chief Operating Officer at Alcorn McBride. Scott Harkless, Alcorn McBride’s Chief Innovation Officer, and Joe Fox, Senior Project Engineer at Birket Engineering, met at a TEA event. Seeking a career change, Fox was looking for a pathway into the industry. “The TEA has been the genesis of all the good things in my life that have happened over the last five years – it led to my wife and baby, a new house and job. The TEA has been life transformational for me,” he declares. Fox, the 2018 winner of the TEA Peter Chernack Distinguished Service Award and a TEA Eastern board member, joined Birket in 2013. He had previously worked in educational software for urban school districts. Then he took Steve Alcorn’s online Imagineering class and took Alcorn’s advice to get involved with the TEA and IAAPA. “I did everything Steve recommended and it led to every good thing in my life,” says Fox. 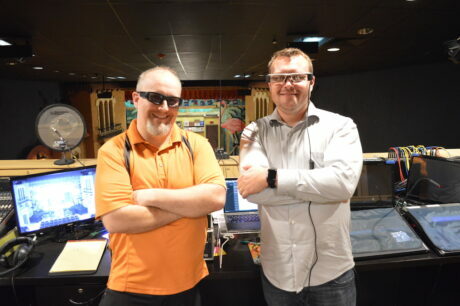 Recently, Alcorn and Birket have teamed on what Harkless calls, “the biggest project we’ve ever collaborated on.” Their solution for delivering Augmented Reality (AR) captions to guests with special needs who are attending parades or dark rides was borne out of an Alcorn customer’s challenge: develop an effective captioning system to replace those being discontinued by manufacturers and design something to serve guests who are moving about and not standing in a specific spot designated to receive captioning information. The result was inThrall. Alcorn McBride’s RidePlayer synchronous audio player and show controller captions the entire parade or attraction and delivers captioning information to Vuzix Blade AR smart glasses running Birket’s Android-based inThrall app. The smart glasses worn by guests sense the nearest parade float or attraction zone and overlay text without obscuring guests’ views. The easy-to-implement solution requires no configuration by the operations staff.